Dororo finally asks us to consider if all monsters should necessarily be killed. Hell, are they even necessarily evil? If they have to eat humans in order to survive, what choice do they have but to kill? Frankly, this has been a question I’ve been waiting for the anime to broach. It’s easy to just assume that the bad guys are inherently bad. This way, we don’t need to understand them. We don’t need to understand why they do the things that they do. But this simple episode finally asks a few pertinent questions. The anime doesn’t necessarily provide us with satisfying answers, but it’s a good starting point. 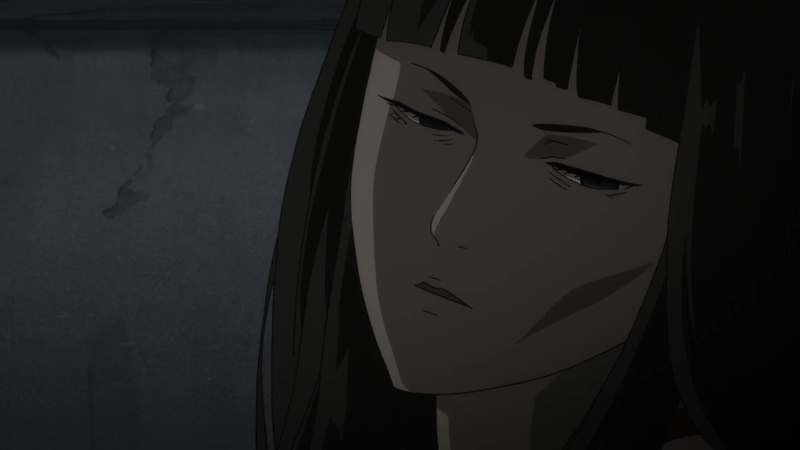 And all it took was for an ayakashi to pause and understand the very prey that she has often looked down upon. 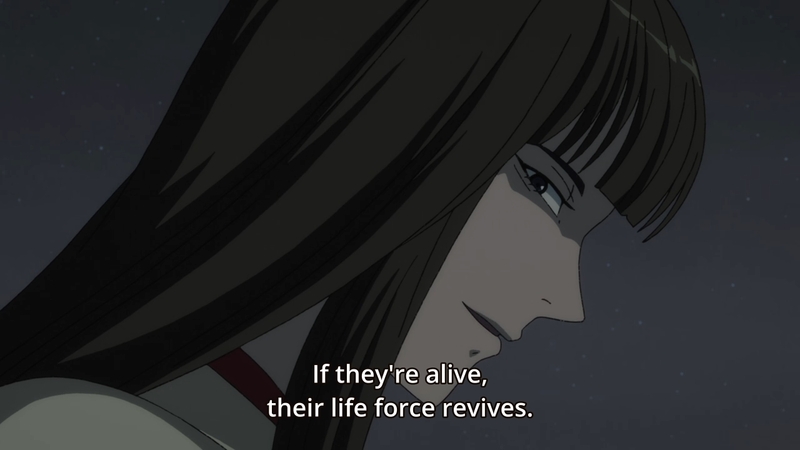 We see from this episode that if Ohagi, a spider-like ayakashi, doesn’t feast upon men’s life force, she will slowly die. Surely, we have the right to defense ourselves from being hunted and killed. I’m not going to sit here and claim otherwise. It’s not like I’m going to go out into the forest and let a bear eat me. But again, what choice has a monster got if they must consume us? Am I supposed to call them evil for simply fighting for their own survival? Luckily for Ohagi, she’s got another option under her belt, and this allows her to find not only redemption but even something as cheesy as love. 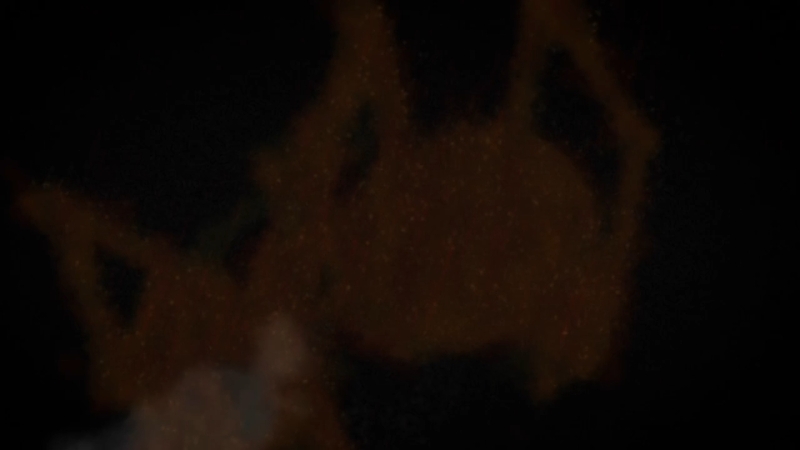 We should know by now that Hyakkimaru goes after any creature whose soul is stained in red. But near the end of the episode, he backs off and lets Ohagi live so that she and Yajiro, her apparent lover, may escape the quarry village. In fact, when our hero gazes upon her soul, he sees its color fade from crimson red to perhaps a muddy orange. I guess this can only mean that she has turned a new leaf. What’s important to keep in mind is that Ohagi used to be a killer. When a wounded Yajiro looks up at her and asks, “Ohagi, you never have (killed), and you never will (kill), right?” she never answers him. Instead, we look at Hyakkimaru as he slowly lower his blade. She’s no longer considered a target in his eyes. When morning comes, Dororo informs us that the couple is gone. Since she wasn’t mortally wounded in her brief scuffle against Hyakkimaru, I have to assume that she and Yajiro successfully escaped. 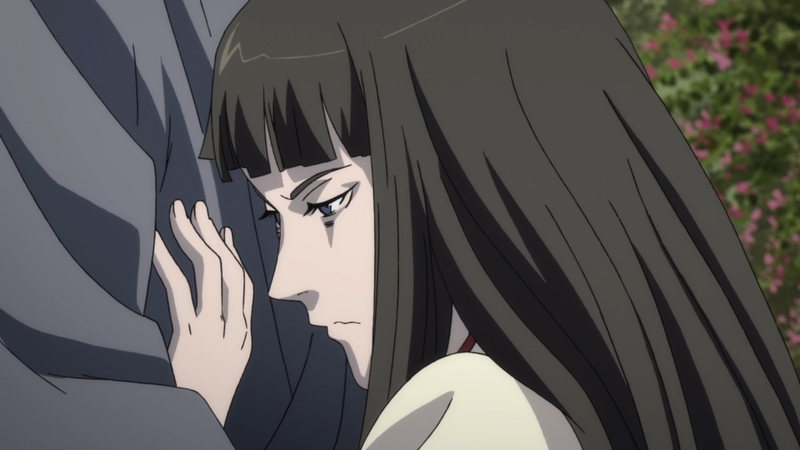 Just earlier in the episode, Ohagi had told Yajiro that she doesn’t need to kill in order to survive. Yes, she derives sustenance from the life force of men, but she can leave behind just enough so that her prey may recover. It’s thus technically possible for her to live a long life with a single man provided that she doesn’t drain him completely. To nobody’s surprise, Yajiro volunteers to become Ohagi’s partner. Before their escape, however, the couple was trapped in a quarry village in which yet another cruel lord is working his subjects to death. Even when an accident occurs, the tired and hungry laborers are forced to continue toiling. People are not even allowed to leave the village without permission, because the evil lord needs all the manpower he can get. And yet, it doesn’t appear as though Ohagi pities the victims. Why is that? I suppose I can only speculate, but it’s easy to be jaded. It’s easy to assume that these victims would be no different from their abusers if they had the same amount of power. But I digress. 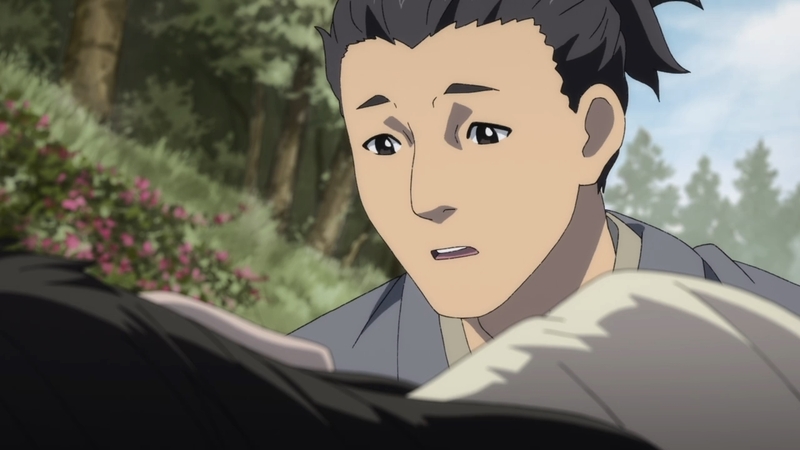 As it turns out, a kindhearted Yajiro has been secretly helping people escape. This means people turn up missing, but in a world full of demons, you always have someone to blame. Just chalk the mysterious disappearances up to an evil kidnapper (possibly a monster!). 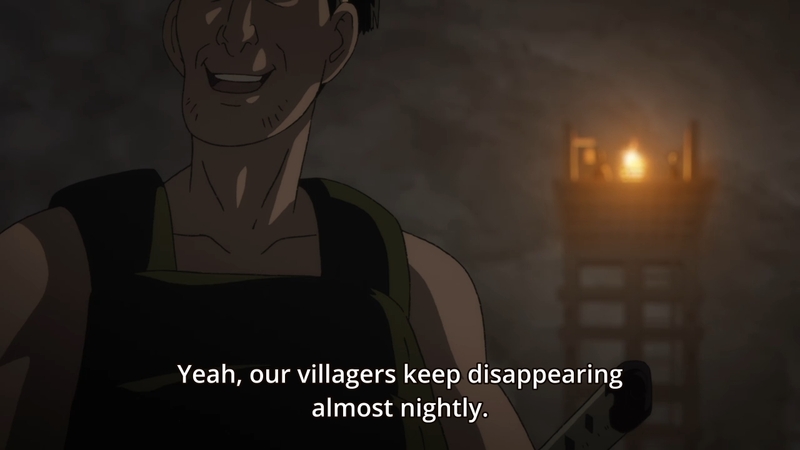 Dororo and Hyakkimaru arrive to the village thinking that there’s a reward to be had, but even though Ohagi was last seen preying upon a man at the start of the episode, it quickly becomes apparent that she’s not the culprit behind all the missing people. So again, it is obvious that humans are just as capable of cruelty as the so-called monsters of this world. Let’s be clear about one thing, though: Ohagi was clearly evil. Was. This is obvious by the fact that when Hyakkimaru used to look at her, he saw nothing but red. Again, she doesn’t have to drain men of their life forces completely; she can actually spare them and let them live but she hasn’t. The implication here thus becomes obvious: she has been killing people because she believes humans are no different. She looks across the land and sees nothing but evil lords and their weak, pathetic subjects. These lords don’t have to work their people to death, but they do. So why should Ohagi try and be any different? Why should she bother to protect the sanctity of life? Like swatting an annoying fly, she initially sees no reason to hold back against her prey. 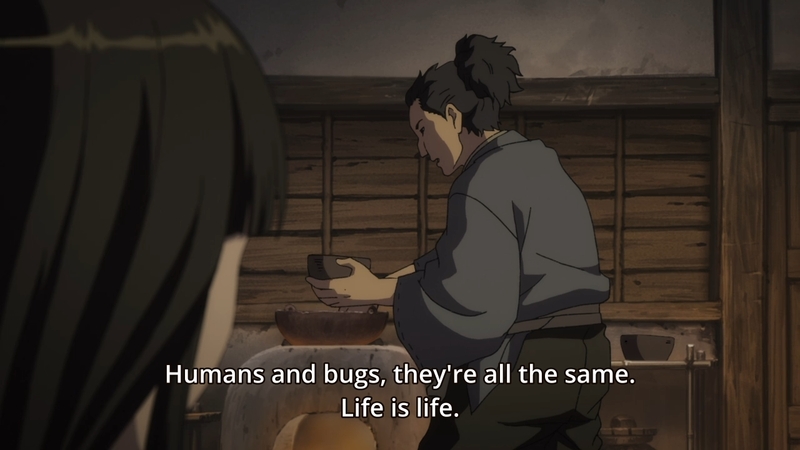 But in Yajiro, she meets a man who wouldn’t even kill a cockroach. He can show compassion for any creature, so by extension, he can even show compassion for a monster like her. In fact, this is exactly what he does. The moment he laid eyes on Ohagi, it appeared as though Yajiro had fallen in love at first sight. So in return, Ohagi finds her redemption in his love. Damn, that’s corny, huh? But for once, we get an uplifting message from the series. 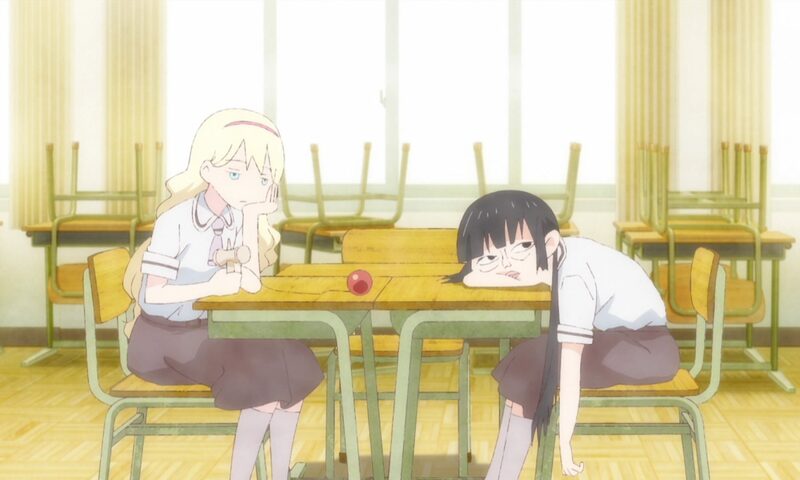 I just wish it had come an episode earlier. You know what I’m talking about. 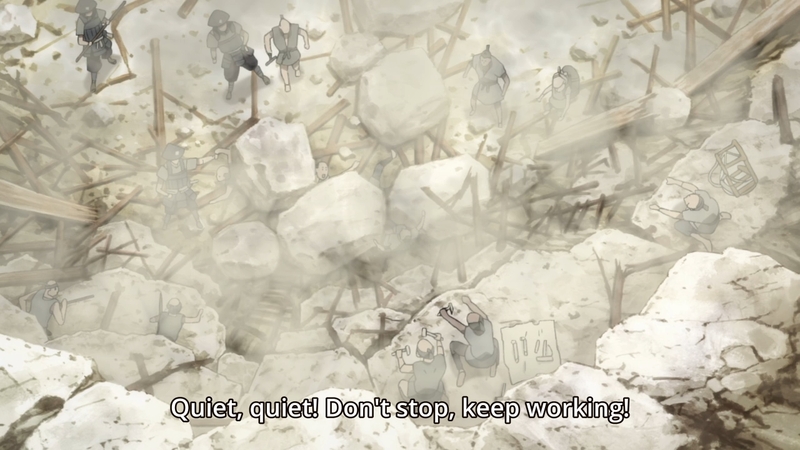 As a quick aside, I guess the only problem here is that Ohagi’s past victims will never find proper justice. All major religions teach us to forgive and forget, though. So chill out, Kant.